I call your attention to this particularly egregious Leftist website because ... these guys represent ME. That is, I am necessarily (by virtue of my employment in a "union shop") to be a "fair share" member of the Service Employee International Union, or SEIU. If ever there was a Rogue's Gallery of Labor Unions, SEIU would rank near the top along with the AFL-CIO. I say all of this not to denigrate my Union, but to emphasize how badly Unions have been subverted ... or perhaps a better word woud be "perverted" ... to the cause of Political Parties. I don't like this. I'm very close to sending a letter to SEIU stating that their political policies do no represent mine, and asking for a refund of monies I have contributes (willy-nilly) from my paycheck which are apportioned to political causes. Stage 1 was "Walk The Plank". An easy stage, there should be no problems, right? Easy ... unless you can't keep your pistol in the holster. I was actually the first shooter on the stage in my squad and I kept my hand on my pistol (securely locked in my Race Holster) on my way up to The Plank. Unfortunately, a following shooter declined to manually retain his pistol, and it popped out of his holster and hit the ground when he stepped up on the stool. There was a bit of a hush, and then the Range Officer performed his duties of moving the competitor away from the grounded pistol, then picked the pistol off the ground, cleared it, and carefully handed it back to the competitor. The shooter said: "What now?" The RO said: "Now you go home". 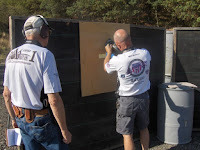 Of course, the pistol was safed; but the USPSA rules have always been clear on this point. If a pistol hits the ground when not under deliberate control of the shooter, that is cause for a Match DQ. The shooter is always responsible for the gun. There are no valid arguments against a Match DQ in this situation. In this case, the stage acted as a "Holster Retention Test", and we all learned from it. Still, it was a bit scary. We always tend to over-react when a Safety Rule is violated, however inadvertently. Fortunately, I was not filming the shooter, so we need not indulge our "slow down to look at the car wreck on the Freeway" tendencies. but I did film a couple of shooters in the same squad, who heeded the lesson and were very careful to control their pistol when mounting the step-stool to The Plank. All Quiet - But Why? As usual,I'm still posting the excellent articles by Jim Shepherd on "The Shooting Wire" (subscribe here). And I'm still encouraging those of you who have not yet subscribed to this excellent Shooting Sports thrice-weekly shooting-sports related newsletter to subscribe. Over the past few days, I've been running one of my extremely non-scientific, non-comprehensive, not-representative-of-anything-other-than-what-people-tell-me surveys of the firearms retail business. And the research tells me what everyone already knows: gun sales are slowing again. It seems the "Barack Boom" has started to go bust. No real reason, other than maybe the fact that everyone has all the AR-style rifles they can shoot, store or afford, but there is an undeniable slowdown --virtually across the board. One exception, the still-ubiquitous .22 caliber rifles. They are selling quite well - probably because we've all realized that our assorted thumper guns have become the "gas guzzlers" of the shooting industry. OK, I know some of you are going to take a shot at me for that analogy, but it's a simple fact- even to a writer who's been fortunate enough to have enjoyed lots of chances to shoot up someone else's ammo - that the days of "here, I don't want to haul this last 100 rounds of (your caliber here) back to the office, so you take it" are as gone as the roaring twenties. Today, when an event's over, the ammo, and in some cases, the brass itself, is gathered up, boxed up, and shipped back to the office - or on to the next event. And the number of "events" isn't what it used to be, either. Handguns, especially those little ones we've written so much about, continue to sell through very well. And as the calendars count down to hunting seasons across the country, there is a moderate amount of interest in the traditional-style hunting rifle. Along with those rifles and some shotguns where mandated for deer hunting, scopes and other accessories/necessities are also moving pretty well. The most positive thing I'm continuing to hear is the steady demand for qualified firearms training. It's reassuring to know that many of the first-time gun buyers aren't just sticking them away for future reference. They're getting real instruction and putting in some basic trigger time. That will make them considerably more inclined to get off the sidelines and start shooting for recreation. As Rob Leatham says, he's never had anyone he's invited out to the range tell him they've had a bad time. Ditto everyone else with the possible exception of a few former military instructors. Their training's a bit too intense for most, although it's quite effective. But it's very quiet out there in the industry right now. Discussion with other observers attributes that to several factors, not the least of which is companies working on their 2010 budgets, preparing their materials for 2010 rollouts at SHOT Show, and getting the last-minute kinks out of new products. A couple of things worth noting....Legislation headed to California Governor Arnold Schwarzenegger's would eliminate all gun shows at San Francisco's Cow Palace. According to the Oakland Tribune, SB 585 stipulates that no more than five gun shows may be held at the Cow Palace during 2010, 2011, and 2012. All gun shows would be out in 2013. According to Sen. Mark Leno (D-San Francisco) the bill outlawing the shows is "about respecting local values and local standards." The whole stink is over a series of gun shows called "Crossroads of the West" which are held periodically at the Cow Palace. They regularly draw between two and three thousand Bay Area residents. In fact, the next show is scheduled for September 19-20. No word on what will happen for the shows scheduled for November, January, March and May. If the law passes, that will fill the five show quota, effectively eliminating all gun shows there. Alameda, Marin and Los Angeles counties have already enacted local ordinances banning gun shows at county-owned facilities. As I've written before, it never stops, and we'll keep you posted. One of the 'good' surprises was the extent to which the range had been improved during the past six months. Due to the purchase of more land on the North end of the range, there is now room for competitors to park 'nose in' rather than the parallel parking which was mandatory before this summer. Also, the USPSA match this month was staged completely on the East side of the North Range, which allowed parking in a large field. And some kind soul even cut stair-steps in the middle of the 5-bay segment, which allowed competitors to choose to ascend to the raised level of the new bays without necessarily walking all the way to either access ramp. Our squad started on Stage 5 ("Fort Apache"), a Comstock field-course which required the competitor to not only start with an unloaded pistol on one of two barrels, and all reloads to be pre-staged on the barrels ... but also mandated engaging most targets through cruciform ports which were 2" wide on each form of the cross-shaped port. This caused some problems, which were not immediately obvious. Most of the early shooters recognized that rounds which passed through the "impenetrable" vision barrier counted as misses. But in the actual event, it was virtually impossible to perceive that the pistol was not aligned with the cruciform port. As a result, targets were often engaged with the sight-line through the open port, but the muzzle of the pistol was significantly aligned below the cross-arm of the port. I was the Range Officer for the first several shooters on my squad, so I was unable to take pictures of the ports as they were degraded by 'bad hits'. The first shooter put six or seven shots through the vision barrier. The second shooter also put several shots thru the vision barrier, as did the next 2 or three shooters. 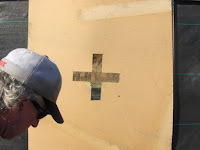 We taped the holes between shooters, but we discovered that many of the guns ... especially Open-class guns with their Compensators ... tended to blow away the tape concealing earlier bullet holes. Even if the pistols were correctly aligned through the port, the side-blast usually blew the tape off the earlier bullet holes. Eventually, it became a challenge to the memory of the Range Officer whether he could remember which bullet holes were new, and which had been the result of impact of previous shooters. Then the Hobo Brasser shot the stage and was penalized for "impenetrable hits". He (rightly) protested the penalties, because he had fired more than the minimum number of rounds necessary to legally engage all the targets. After some discussion, I ruled that he was correct and he was required to reshoot the stage because "it is impossible to score the state". Finally, someone with his compensated pistol blew away the lower 2" of the left arm of a crucifrm porthole. We attempted to reconstruct the original profile of the port by placing tape over the gigantic hole, but the next shooter blasted that tape away with his second shot. Who could determine where the shot went when the structure of the port was essentially destroyed? At this point, I turned to the stage designer (for the second time) and declared that "this stage is unacceptable, because it is impossible to score accurately and consistently." Since only 4 competitors had shot the stage, it was possible to reshoot these shooters ... after the ports were re-cut so that a diamond-shape (about 8" on a side) replaced the cruciform port. As it happens, a further modification was found to be advisable; because compensators tend to degrade shooting ports, tin-foil was added to the upper two edges of the ports, to prevent a dramatic change to the configuration of the ports. Ultimately, including the time needed to effect the stage modifications and to allow the first four competitors to reshoot the stage, it took us (a squad of only 9 people) more than an hour to complete the stage. On this stage, the average time was about 30 seconds; which illustrates the reason why a stage which should have taken less than a half-hour to complete actually required twice the time. When designing or constructing a stage, it's important to consider how the props can deteriorate during the normal usage of the stage. Ports which excessively restrict the passage of bullets which miss the legal port may be subject to protest by shooters who realize that it is exceedingly difficult to consistently and fairly determine which shots were un-legally aimed at legal targets through a port which is subject to deconstruction. 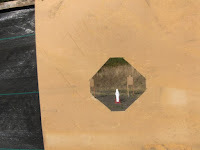 Finally, it is well to realize that a shot through a needlessly constrictive port, and which knocks down a steel target even though the round passes though a vision barrier, is immediate cause for a re-shoot because of Range Equipment Failure. "So. Whose bright idea was it to make ports needlessly constricted in the first place? " Oh dear, this is my fault because I made the stage sound too horrible for words. In the event, it was a good stage. It's just that one element was added to test the shooters' ability to shoot through a very restricted port, and the experiment failed. This was a club match, which means it had no effect of shooter rankings. There was no prize table, no rewards other than "bragging rights", and historically this venue has served to try out new twists on the run-of-the-mill stage designs such as "Underwater Submarine", which the commenter mentioned. The stage designer wanted to try out a new twist, and it didn't ... quite ... work. Nothing more or less than that was intended, and it's notable that the stage designer took the time to watch the first squad shoot the stage. When it was obvious that the design wasn't feasible, he modified the stage props so that it worked, and we only had to reshoot four competitors to prove that the new stage construction worked. Let me put this in some perspective. I am very critical of stage designs, and although I was leery of the restricted ports I made no protest until a couple of shooters had tested it and we found it to be unusable. When it was ultimately proven to be unusable, the problem was fixed and we completed the stage before the next squad caught up with us. Perhaps I made it sound more egregious than it deserved, but over-all the stage design was good. It allowed us to wring out the new design element, and we all learned from it. Thats all it amounted to, and if I made it sound as if there was a lack of responsibility involved, that was my fault. I do tend to dramatize events, for readability, and in this situation I should have been more responsible in the original version of this article.